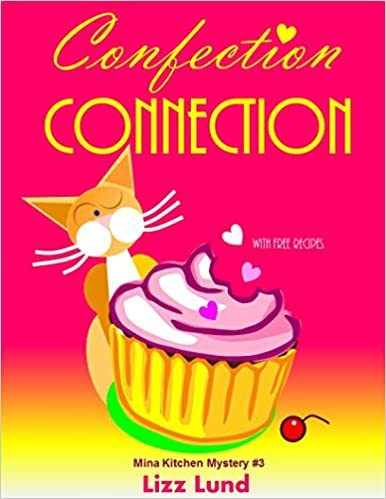 Lizz Lund continues her Kitchen Connection mystery series with book four, Confection Connection. In Confection Connection, Heroine Mina Kitchen is unemployed, but that doesn’t means she has nothing to do with her time. Between social engagements with faithful friends and family, she is busy nurturing a budding catering business with her new questionable boyfriend James and working every goofball side job she can pick up to keep her van, aptly named Doo Doo, filled with gas. The handsome Chef is still in the picture as the quietly nurturing mentor to her ripening culinary skills and her questions about what might have been if he had shown up for their New Year’s Eve date. Meanwhile, Mina becomes the unknowing witness to multiple crimes around her fair city of Lancaster. It’s no wonder she barely has time to enjoy quality time with her fat cat and movie-watching bird. In Confection Connection, Lizz Lund uses humor and a delightfully quirky cast of supporting characters to keep Mina hopping from one plot point to the next. I was annoyed every time real life interrupted my reading of Confection Connection. I would have loved to curl up with a mug of hot chocolate and a fancy confection loaded with frosting and read Mina’s tale from cover to cover. I especially enjoyed the Swifter-addicted next door neighbor who was in the witness protection program. And the cat who fell in love with a pink muff. I don’t understand the connection between Mina and James. Even if she is fortyish and alone, there should be some spark, but this did not come through. The mere fact Mina was in a quasi-relationship with someone she really had nothing in common with felt sad and worked against the whole uplifting vibe of the book.